Froswick is one of a series of fells on the impressive ridge that separates Kentmere and Troutbeck and that helps give the Troutbeck valley its special character. This is a long fairly straight steep sided ridge that runs for nearly five miles along the eastern side of the valley. From the Troutbeck side the Yoke-Ill Bell -Froswick ridge looks like a single long fell with a series of linked summits rather than a collection of individual fells. The individual fells in the ridge look much more identifiable from the Kentmere side, where they are separated by a series of coves. Over Cove sits between Ill Bell and Froswick, with a nameless cove to the north. When you are on the ridge itself each of the fells gets its own character. From here Froswick sits on a bend in the ridge - the path to Ill Bell heads south, while the path to Thornthwaite Crag and High Street heads north-west and only turns north after leaving Froswick. Froswick really can only be climbed along the Yoke-Thornthwaite Crag ridge. If coming from Kentmere then this is part of a larger circuit, best approached from Nan Beild Pass and Mardale Ill Bell in the north or Garburn Pass in the south. If coming from Troutbeck the Garburn Pass option is still available. The ridge can also be reached by heading up to Threshthwaite Mouth between Stony Cove Pike and Thornthwaite Crag, or using the only path that cuts up the side of this ridge, following Hagg Gill before taking a more gentle route up towards Thornthwaite Crag. The eastern and western slopes of the fell are both too steep to be used by walkers. 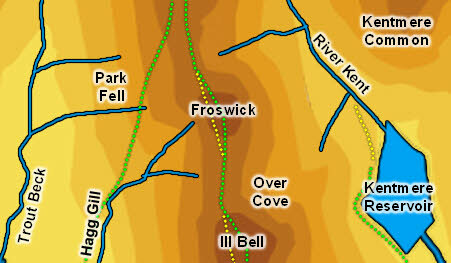 The Kentmere Round visits Froswick. Froswick has a small triangular summit, with steep slopes to the north, east and south. It can only really be reached along the south or north-western paths. There is also a path that cuts across the western slopes for anyone heading along the ridge but who doesn't want to visit the summit. In the west Hagg Gill forms just below the summit and then heads south-west, cutting an obvious groove across the fell, but it can't be said to form the northern boundary as the lowest point between Froswick and Thornthwaite Crag is to the north of the start of the beck. The north-western boundary is thus one of the nameless becks that flows west into Trout Beck. Trout Beck forms the western boundary and another nameless beck the south-western boundary, flowing in Hagg Gill - indeed Hagg Gill could be seen as a southern boundary on this flank. In the east the River Kent forms the eastern boundary. The north-eastern and south-eastern boundaries are both formed by nameless becks.